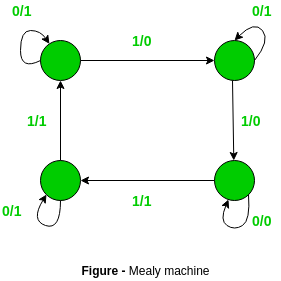 Mealy Machine – A mealy machine is defined as a machine in theory of computation whose output values are determined by both its current state and current inputs. In this machine atmost one transition is possible. 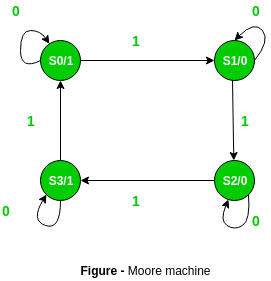 Moore Machine – A moore machine is defined as a machine in theory of computation whose output values are determined only by its current state. Output depends only upon present state. If input changes, output does not change. More number of states are required. There is more hardware requirement. Synchronous output and state generation. Output is placed on states. Output depends on present state as well as present input. If input changes, output also changes. Less number of states are required. There is less hardware requirement. They react faster to inputs. Output is placed on transitions. It is difficult to design.